Visualize for a moment a soothing, warm – very warm – bath. You are completely immersed in what is arguably the most pleasurable of all daily routines. Happy and entirely contented are words that help explain this enjoyable, relaxing process. If you happen to be one who prefers the same experience via the shower, it’s no wonder that “singing” is associated with this ritual. Can there possibly be anything wrong with this picture? Not much can spoil this small luxury until one is forced to leave the almost-tropical experience and step out onto a cold floor, reach for a cold towel and stand shivering in a cold room that is either too far away from the thermostat to have any effect or, is of necessity, kept at an energy-saving temperature in order for the average person to be able to pay skyrocketing fuel bills. Because of experiences similar to these, Warmzone is receiving a growing number of calls from customers seeking answers to questions regarding radiant heating in bathrooms. We’ve discovered some exciting alternative products that can be used to heat bathrooms and help to complete the transition from a warm tub to a warm floor, or from a warm shower to a warm towel and of course a warm room. Heating areas such as bathroom floors with electric radiant heating cable systems from Warmzone makes the most sense. Electric radiant heating systems are efficient, easy to install, and very cost effective. Warmzone radiant floor heating systems are controlled by a thermostat with an in-floor sensor and have a very quick response time, and are maintenance free. 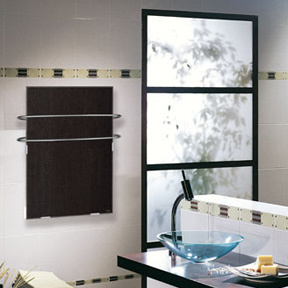 A popular item in Europe that is now making its way into homes throughout Northern America is the towel warmer. Warmzone features top quality towel warming products from Climastar and ECO-heater wall panel heaters. These premium – yet affordable – towel warmers and bathroom heaters provide comfortable radiant heat to your bathroom with the added benefit of warming and drying towels. Their beautiful designs will add both warmth and a European comfort to your bathroom. The radiant bathroom heaters are all-inclusive, with a programmable thermostat and a simple plug in design or can be hard wired for a cleaner look. Warm your towels while heating your bathroom with the finest towel warmers available! You will love the comfort of a warm towel and a warm bathroom. Another product that can be used to heat bathrooms is a body dryer. Body dryers operate similar to hand dryers found throughout the world, though on a much larger scale. By adjusting power and heat individuals can use these to dry themselves and to heat small areas. A similar class of products to the body dryers are heat lamps which using the principles of radiant heat, are able to effectively warm a small area. If you might be interested in upgrading your shower to a steam room – your own personal spa – products are available to help you do just that. With steam generators, any shower, tub or enclosure can become a steam room. Providing rich, moist heat, steam generators will convert a conventional shower into a steam bath. Two additional bathroom products that are gaining popularity are mirror de-foggers and heated bidets with warmed toilet seats. While these might seem to be a little bit “over the top,” they are actually quite practical and worth looking into. Mirror de-foggers are generally thin heaters that are adhered to the back of a mirror and wired to the same power supply as the bathroom light fixture, fan or separate switch. When turned on the pad heats up and keeps the mirror dry and free from fog. Bidets with heated toilet seats (popular in Asia and Europe) are proving to be a new seller in the U.S. because of the comfort and added health benefits offered by bidet use. Before spending another winter stepping from the warm comfort of your bath water to the frigid touch of a cold floor and towel, visit www.warmzone.com for more information on the above-mentioned products. For detailed information on heated floors and space heating products Warmzone offers, visit call a radiant heat expert at 888-488-WARM (9276). Radiant heating, as opposed to warm air systems (such as a forced air unit heaters), deliver the source of heat to the floor level, not the ceiling. And since warm air rises, heating the floors proves to be the most efficient means of heating living areas. Radiant floor heating or radiant energy is the oldest form of heating used to provide comfort and is the basis for all heating systems. Radiant energy is totally pure radiation and is absorbed by an object without physical contact with the heat source or by heating the surrounding air, as is the case with convective, forced air systems. Under floor heaters were first used by the Romans. Initially the preserve of the rich, under floor heating became increasingly commonplace in public buildings and villas, particularly in the colder regions of the Roman Empire. The Roman system was based on hypocausts, comprising ducts that underlay the floor (itself built on raised brick piles) and flues that were built into walls. Hot air or steam from fires circulated up through this system, warming the floor and walls, with heat passing into the rooms. More specifically, the floor was laid out as series of concrete slabs acting as radiant heaters supported by columns of layered tiles, with a furnace at the bottom of one exterior wall. By placing the fire here, the draught would take the radiant heat under the floor, and up through the walls to radiant heater chimneys located in the corners of the room. Today we recognize the brilliance of the Romans and Koreans as early adopters of radiant heating, as the technology is still a desired method for delivering comfortable and efficient heat in our homes. Now we have radiant heaters using electric resistance cables that are constructed of highly rated materials and feature manufacturer warranties of up to 25 years.